With six arenas of top dressage competition and championship festivities lasting well into the night, the Kentucky Horse Park was the place to be on Saturday as 12 new champions were crowned at the US Dressage Finals presented by Adequan®, being held November 8-11 in Lexington, Ky.
As a foal, Carol McPhee&apos;s Westfalen gelding SenSation HW (Sunday x Donata by Dancier) was given a promising name, and since then the young gelding has proven he has every ability to live up to it. In the hands of Michael Bragdell of Colora, Md. 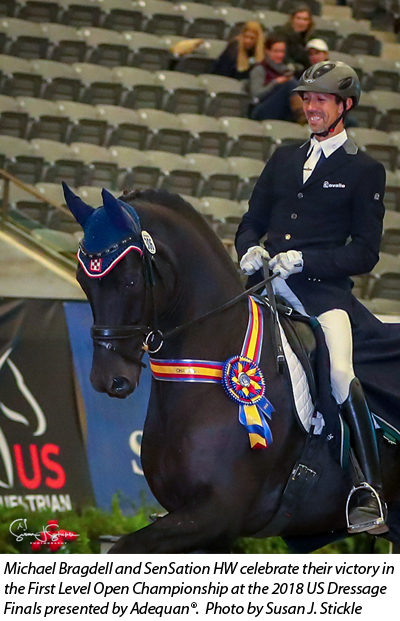 (Region 1), SenSation HW was crowned as five-year-old champion at this summer&apos;s Markel/USEF Young Horse Championships, and now added another title to his resume by winning the First Level Open Championship at the US Dressage Finals with 75.049%. As an orthopedic surgeon, it would be stating the obvious to say that Bethany Gallagher of Nashville, Tenn. (Region 2) has a demanding career. 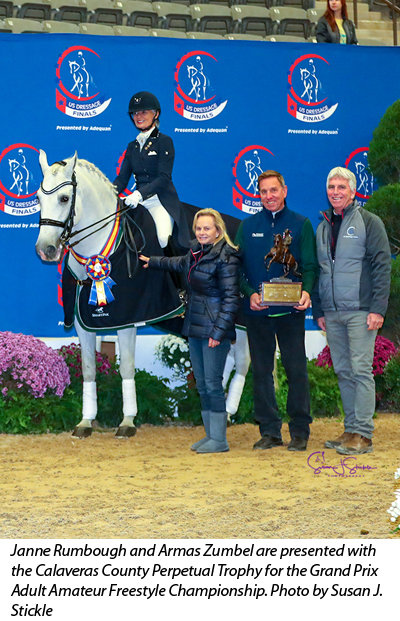 But ultimately finding a way to balance both work and riding turned into a winning formula as Gallagher earned the First Level Adult Amateur Championship over more than 30 rivals with 72.794% earned aboard her seven-year-old Hanoverian mare Fabiola. When Mindy Elgart of Philadelphia, Pa. (Region 1) first saw her horse Spaniard (Sinatra Song x Russian Roulette by Rouletto, bred in the U.S. by High Point Hanoverians), he was just a tiny foal featured in an e-mail. 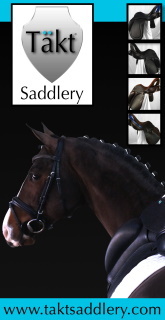 Little did she know that six years later, the 17-hand Oldenburg gelding would help her win a national title in the Second Level Adult Amateur Freestyle Championship with a score of 70.922% at the US Dressage Finals. 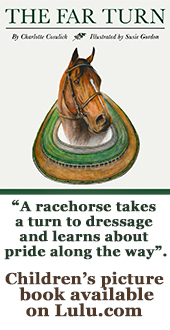 To say that Alice Tarjan of Oldwick, N.J. (Region 1) has a barn full of equine talent would be an understatement. After winning two national titles with Candescent earlier in the week, Tarjan braved the cold in the Stonelea Arena as part of a field of almost 30 top horses and riders from across the country in the Third Level Adult Amateur Championship. Turns out, the only one Tarjan had to beat was herself as she earned both Champion (75.043%) and Reserve Champion (74.017%) honors with her seven-year-old Oldenburg mare Donatella M (Furstenball x Dorina by Jazz Time) and six-year-old Dutch Warmblood stallion Harvest (Connaisseur x Naomi by Ulft), respectively. Following a one-two finish in Friday&apos;s Third Level Open Championship, Martin Kuhn of New Berlin, Ill. (Region 4) was able to turn the tables on fellow competitor Angela Jackson in the Third Level Open Freestyle Championship. But it took quite a bit of improvisation to get that victory on a score of 73.433% with Elizabeth Cronin&apos;s seven-year-old Westfalen gelding Venivici (Vitalis x Sabrina by Sherlock Holmes). Sandi Chohany&apos;s Oldenburg gelding Au Revoir (Ampere x Lara by Liberty M) is no stranger to the winner&apos;s circle at the US Dressage Finals. Despite being only seven years old, the talented youngster has previously earned national titles at both First and Second Level in previous years in partnership with rider Heather McCarthy of Prairie Grove, Ill. (Region 4). And on Saturday the pair added yet another accomplishment to their resume: as the only combination to break 70%, McCarthy and Au Revoir topped a tough field in the Fourth Level Open Championship with a score of 71.370%. Finals first-timer Hannah Hewitt of Atlanta, Ga. (Region 3) is now two-for-two at the Intermediate I level after winning Friday&apos;s Adult Amateur Championship class followed by Saturday&apos;s Intermediate I Adult Amateur Freestyle aboard Tammy Pearson&apos;s eight-year-old Dutch Warmblood gelding Fidens (Tango x Bliss by United). 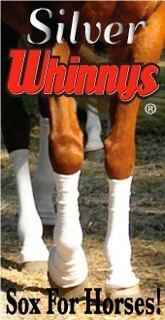 The pair ran away with the win by earning top scores under all three judges for 75.050%. Every fall, Nora Batchelder of Williston, Fla. (Region 3) makes coming to the US Dressage Finals a goal for herself, and this year she&apos;s is on a roll in the small tour. After four hours of hard-fought competition in the Alltech Arena in the Intermediate I Open Freestyle Championship division, Batchelder claimed not only the Champion&apos;s title but Reserve as well. 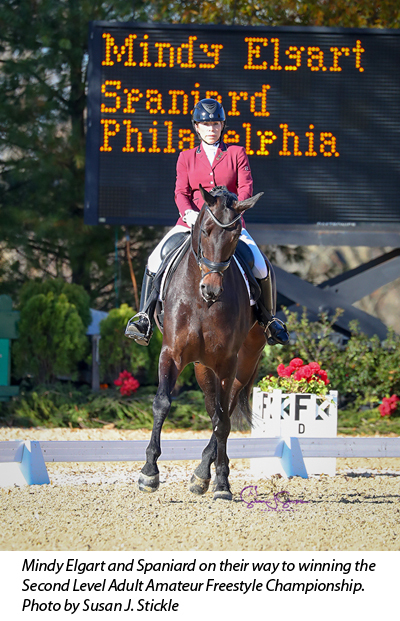 Her 10-year-old Hanoverian gelding Faro SQF (Fidertanz x MS Rose by Rotspon, bred in the U.S. by Jill Peterson, owned by Batchelder and Andrea Whitcomb) earned a winning score of 77.383% to edge out stablemate Fifi MLW (nine-year-old Hanoverian mare [Fidertanz x Wolkenstanza MLW by Wolkentanz I], bred in the U.S. by Mary Winn) with 76.783%. “His music is actually a professionally-made freestyle with Cirque de Soleil music which I re-used from another horse, but it fits him well,” said Batchelder. “But for Fifi I wanted something a little lighter, so her music has violin covers of popular songs like Taylor Swift. I made the freestyle myself and I think it suits her. 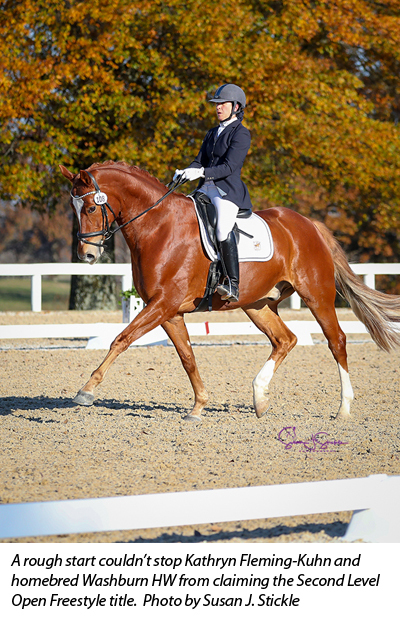 Coming to the US Dressage Finals created a bit of a temperature shock for Janne Rumbough of Palm Beach, Fla. (Region 3) and her 15-year-old PRE gelding Armas Zumbel (Escarzo x Delicia VI by Relampago II). But the pair braved the chilly weather to claim the Calaveras County Perpetual Trophy (presented by Olva Stewart Pharo) in the Grand Prix Adult Amateur Freestyle Championship with a score of 64.467%. During festive evening performances of Grand Prix freestyles in the Alltech Arena, it was crowd-favorite Adiah HP and North Carolina&apos;s James Koford (Region 1) who once again rocked the house to claim the Jazzman Perpetual Trophy (presented by Donna Richardson) and successfully defend their 2017 title in the Grand Prix Open Freestyle Championship. Koford and the 11-year-old Friesian Sport Horse mare (Nico x Marije ANT by Anton) unveiled a new freestyle featuring music from owner/breeder Sherry Koella&apos;s former international magic show, which proved to be a hit with both the audience and the judges, earning a top score of 71.767%. Watch archived streaming videos Championship classes on the USEF Network HERE, as well as Facebook Live videos of press conferences on the USDF Facebook page HERE. Championship competition concludes Sunday – follow the action through updates on the USDF Facebook page and the US Dressage Finals website, as well as watch live online streaming on the USEF Network at this link: https://www.usef.org/tune-in. 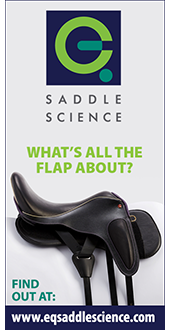 To learn more about the US Dressage Finals presented by Adequan®, download competition information, review day sheets and results, and read daily news releases, visit the official event website at http://www.usdressagefinals.com.